How to be a good step parent: do you look after your partner's ex's kids? "It's cheeky isn't it?" Woman utterly perplexed by unusual request from her partner's ex. Speaking from experience, being a step parent is not easy, no matter how hard everyone tries. Parenting another person’s child is a rocky road, and some of that is because often, one of the real parents doesn’t really want you to do it. They want you to be respectful and nice to their kid when they’re with you, but they don’t want you assuming full responsibility – because that is their own job, not the step parent’s. This seems to be a natural way to feel, and the way most parents do when they share kids with someone they’re no longer with; except one woman, who’s assumed her former partner and father of her older kids, will help look after the baby she is having with someone else – and that her kids’ step mum will help, too. 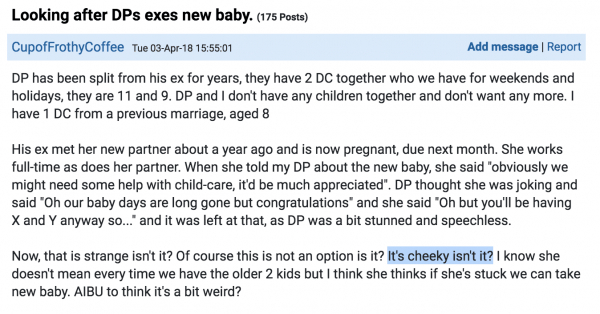 In a thread called “Looking after DP’s exes new baby“, Mumsnet user CupofFrothyCoffee explained her perspective as the step mum. The woman said her partner’s ex is currently pregnant with her new partner – but still seems to think her ex will help raise the child of that new union. “When she told my DP about the new baby, she said ‘obviously we might need some help with child-care, it’d be much appreciated’. “That is strange isn’t it? Of course this is not an option is it? It’s cheeky isn’t it? “I know she doesn’t mean every time we have the older 2 kids but I think she thinks if she’s stuck we can take new baby. Most of the comments agreed with the poster that the request was somewhat unusual. "She&apos;s completely bonkers. Why would you look after her baby?" one asked. "Make sure your partner tells her loud and clear that the baby is not part of any weekend childcare arrangement," another added. "That is not reasonable! If there is an emergency, ill health or PND, this women&apos;s partner, parents, friends, siblings, in laws or paid childcare professional will have to step up," one person bluntly said . One forum user commended the ex for being honest and indicating she might need help sometimes, whilst others suggested the step mum consider how beneficial a happy mum would be to the two step kids. 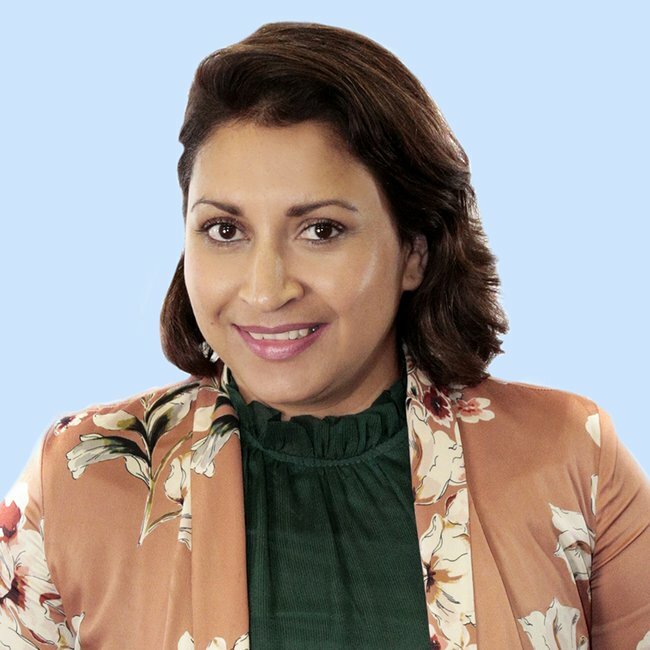 "If mum genuinely struggles, there could be a negative impact on your step children&apos;s lives and as such, perhaps there is an element of &apos;it is our problem&apos;." One last comment approved of the pregnant woman&apos;s gumption. "I&apos;m secretly admiring her cheek tbh," she admitted. We&apos;re not quite sure that CupofFrothyCoffee feels the same way.